“Pitch Perfect 2” picks-up close to where the first film left off. Becca and Jesse (Skylar Astin) became an item, to the disapproval of the oath of the Barden Bellas NOT to “hook up” with a Treblemaker . The explanation of why Fat Amy (Rebel Wilson) had Bumper’s phone number when the Bellas ran out of gas is revealed. “Pitch Perfect 2” is once again directed by the beautiful actress Elizabeth Banks who also reprises her role as sassy a cappella commentator Gail, along with her male counterpart John (John Michael Higgins). Fresh off of the win at the International Championship of Collegiate A Cappella (ICCA), “Pitch Perfect 2” opens with the Barden Bella’s competing at the Kennedy Center in front of current President and First Lady of the United States Barack Obama. Yes, they really are in the movie, and so is Shonda Rhimes sitting behind the couple. Another disaster scenario, repeating from “Pitch Perfect”, the Bellas’ performance of Miley Cyrus’ “Wrecking Ball” goes South when Fat Amy’s mid air contraption causes an unplanned wardrobe malfunction making the Barden Bellas headline news everywhere, bringing the group tons of hate mail as well as being banned from future performances for the rest of the year. The Bellas are lead by Becca (Anna Kendrick) and Chloe (Brittany Snow) minus Aubrey (Ana Camp), the stern ring leader in the first movie, who’s disappearance from the Bellas is explained later in “Pitch Perfect 2”. Aubrey’s new role serves as a nice surprise for the girls at a time when they need team cohesion most. “Pitch Perfect 2” is a win by sticking to the same formula from “Pitch Perfect”, only with a step-up. Becca’s internship in this movie is at a swank record label headed by “Key & Peele”s Keegan-Michael Key. She proves that her mixing talents are much more beneficial to the company than delivering coffee when she impresses during a Snoop Dogg recording session. The Bellas are seriously daunted at the challenge of trying to beat DSM, a group with eight plus members. Hello! Ever heard of “Pentatonix” who won NBC’s The Sing Off” a cappella competition show with only four people? Audiences will see “Pentatonix” in this movie during the a cappella world competition scene. The Bellas’ challenge to keep things creatively fresh is sparked by newcomer Emily (Hailee Steinfeld), nick-named “Legacy” since her mother, played by Katey Sagal, is a Bella legend. Once the Bellas accomplish overcoming their challenges and solidifying their harmony once again, they find a unifying theme – which is sisterhood. They are primed to go after the world championship title of a cappella. Audiences will recognize some cameos in this scene from real-life a cappella groups. The two a cappella competition heads, commentators and hosts Gail (Elizabeth Banks) and John (John Michael Higgins) return with even more insulting commentary this time around. This was a plus to add more dialogue from the colorful duo. Other familiar faces return to “Pitch Perfect 2” including Benji, Jesse, Bumper, Cynthia, Lily along with new-comer Flo who serves as the token Latina girl and tells horrific stories about life in her country. A longer and more impressive “Riff Off” scene than in the first “Pitch Perfect” will amuse fans as well. An unexpected surprise involved the Green Bay Packers where you’d expect to see them the least! Overall, “Pitch Perfect 2” is a great continuation of “Pitch Perfect” using the exact same formula that made the first movie such a successful hit. The advantage of that is people who have not seen the first one, don’t need to in order to enjoy this one. For movie goers who have seen the first one will enjoy this continuation of the characters’ stories and their new high jinks. Stay past the credits because you’ll be treated to a hilarious bit involving Bumper and Blake Shelton! Watch it! I enjoyed this movie so much that I want to see it again. I went into this follow-up without having seen the first one and immensely enjoyed it! When I later watched the first one, it only provided more of a back-story on the characters. Parts 1 and 2 are both equally funny. 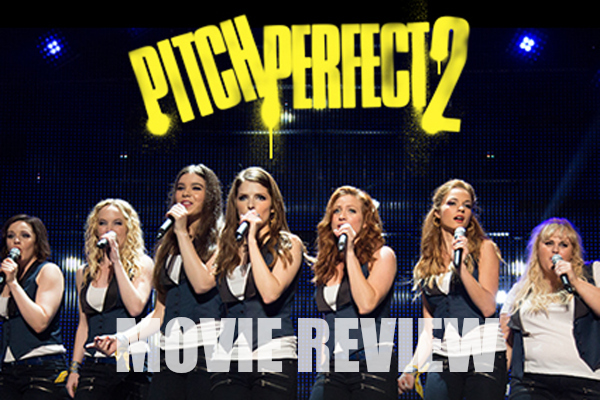 “Pitch Perfect 2” learned from the first one on what made it funniest and expanded upon it. “Pitch Perfect 2” opens in movie theaters Friday, May 15, 2015.